With technology where it is, most people use phones and tablets to do most of their tech work. The average business person uses a desktop in the office or a laptop. Because of the momentum of tablets and phones, laptop development slowed quite a bit…especially given that many started copying Apple’s designs. This overview, written in 2009, pretty much needs no adjustment, although it has been adapted. If you have any questions about how pick the right laptop, here’s what to look for. NetTop – A small version of a laptop, which normally runs on an Intel Atom processor, which is only useful when running a web browser. OS X – The Operating System that comes with a Mac (Also seen as OS X 10). Five different versions: Cheetah/Puma, Jaguar, Panther, Tiger, and Leopard. Peripherals – Objects like a printer, mouse, etc. Windows XP – The 5th release of the Windows Operating System that is widely popular. It is so popular that Microsoft, the creator of Windows, keeps pushing back the kill date of it. It is also the popular choice for downgrading from Windows Vista. If you are looking to buy a new laptop and you do not know what to buy, it can be difficult to make the decision. 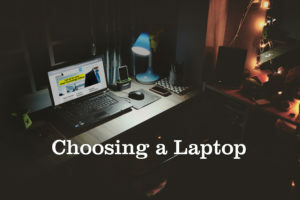 A laptop can be used for personal or business and if this decision is made poorly, you will regret it every time you are sitting there waiting for it to start up. The first thing you want to decide upon is brand. If the brand is not well known, think twice. The computer may be good, but there may be limited support for the brand. There are well known brands that have bad support as well, at times, but it is easier to find help online and/or elsewhere Before deciding on a brand, check Google Groups, YouTube, and do some searches on different search engines (not just Google or Bing). After doing some research, you can either decide on a brand, exclude certain brands, or that the brand does not matter. The second thing to look at is the actual size. If it is really small, be skeptical. If it is really big, be skeptical. If it is about 8 to 25 inches diagonally, it is more likely that it is a better computer. If the computer is really big, over 25 inches, and is not a media centered computer, the hardware is probably outdated. If the computer is really small, under 8 inches, it is probably a NetTop. The weight of a computer does not matter because the weight doesn’t effect performance although the computers at the ends of the spectrum probably are not as good as the ones towards the middle. When it comes to weight, go for what is right for you. Next, open the computer and feel the touchpad. The touchpad is the built-in mouse normally below the keyboard. When looking at a touchpad, see if you like the feel. For me, there are a few things I look for in the touchpad. I look at the height difference from the right and left of the touchpad (we will call it the sides) to make sure they are not even and not to deep, if the feel of the touchpad is different from the sides, and if I like the texture of the pad. These things are useful to look at because you will be using the touchpad often and you want to be able to differentiate from the sides and the touchpad. The keyboard is just as important as the touchpad, but it is easier to determine whether you like it or not. If you like the keyboard from the first time you use it, good. If it is just okay, but you can get used to it, use the keyboard before buying at least for 2 minutes in a row two or three times. If you don’t like the keyboard at all, you should reconsider the computer OR think about getting an external keyboard. The most important part of the computer is the screen. Without having a screen you like to look at, the other stuff doesn’t matter because you wont use the computer. Make sure you like the screen when looking for a computer. Look for durability, texture, glare, and flexibility (some screens are only good within a 145 degree angle). The Operating System gives a good hint into the hardware of a computer. At this point in time, Windows 7 is approximately 11 months away and Vista is the primary OS offered on a new laptop. If you are buying a regular laptop that comes with XP and the price tag is under $700 before tax, you can pretty much rule out that particular computer. If a new laptop doesn’t offer Vista AND the price tag is under $700, that implies that the hardware will not work with vista. The reason the computer, if it offers XP would be under $700 is that the hardware is not of good quality, so you would be waiting for Windows to boot up. Be weary of computers selling other operating systems. They either do not have the right hardware to run Windows, are trying to lower the cost, or sales were not high with Windows. Macs, running OS X 10 are fine if not better than Windows. 2018 Update: Now, I commonly recommend people get a linux laptop running something like Ubuntu and installing windows inside of a Virtual Machine for essential programs. The main benefit to this is it reduces risk of viruses/malware/etc. Choosing the battery is one of the important decisions you will have to make before continuing on. If you plan on having your computer plugged in all the time, you do not even need a battery, but if you need to move that computer even just slightly out of the range of the charger, you either need to unplug it, or shut it down, unplug it, find a closer outlet, plug it in, and turn the computer on. If you just plan to use your laptop with a charger all the time, you probably should look into a desktop instead. If you are looking for a desktop, most information in the article still applies. Laptop batteries are called Lithium-Ion batteries because they run on the reactions taking place with the Lithium Ions. Once the reactions die down, the battery life also goes down with it. With that in mind, picking the battery you want for a computer comes down to a few different options. The common different cells you will see will be 6-cell and 9-cell. 6-cell literally has 6 Li-Ion (Lithium Ion) groupings. 9-cell has 9. The more cells you have, the longer the life of the battery will be. In a battery, the length of time you have it and the total charge capacity are inversely proportionate, unlike the number of cells and the price. Time to consider the charger. For the charger, make sure that it is long enough to suit your needs and that YOU (not an associate) thinks that it will last. Take into consideration where you will be using the charger (if in a regular place) and how often you will use it. If you are looking for a laptop to watch movies on (high def or not), play music, create movies, or something like that, then you should look into a media computer. To tell if a computer is a media computer, check to see if it has many extra features for media. DOLBY Virtual Surround Sound, Firewire, and better screen calibration tools are signs of different types of media computers. Be weary of the price. The more media features it has, the more the price tag will go up. The processor is very important. I like Intel processors, but there are other brands. BEWARE OF INTEL ATOM PROCESSORS!! Atom processors were created to be “eco-friendly,” but they are not. If you use an Intel Core 2 Duo Processor you will do everything in half the time of an Atom Processor which would cause it to be much more eco-friendly. If you write a Microsoft Word Document on a computer running the Atom Processor, you might be on for 20 minutes due to software lag, but with a Core 2 Duo Processor, you might be on for 10 minutes. To compare all of Intel’s Processors would be futile, so look on one of the thousands of search engines for reviews on it. Check the number of GHz (gigahertz) as well. If you cannot find it on the system info, check the Internet. For future applications and Windows 7, to get the most out of your computer, get something that is over 2.0 GHz. The memory on your computer is very important. All of the actions you do on the computer that are not written to the hard drive immediately, are stored in RAM until it is. The higher your RAM, the better, BUT the computer doesn’t really notice a difference after a certain point. You could buy 10 gigs of RAM for your laptop, but it probably wont use all of it, so it might be cheaper and better to just get 4 (2018 update: or 8) gigs of RAM. 2018 Update: Now, you definitely want an SSD. That being said, if you get a laptop without an SSD, factor buying an internal SSD into the cost…say another $150. Internal Wireless Card or External? I recommend an internal wireless card because it is easier to handle. With an internal card, you don’t have to worry about forgetting it. You can get an external wireless card if you have an internal wireless. You can also purchase something from AT&T, Verizon, or another company that will supply you with Internet anywhere. Should you get your computer with the OS preinstalled? On one hand, it is VERY easy to install, but on the other hand, it installs a lot of crapware. If you feel comfortable partitioning, formatting, and installing an OS on your hard drive, you might want to erase the drive or get a blank drive instead of a drive with a preinstalled OS. I recommend for everyone who was not immediately thinking “yeah, I can do that” to get a computer preinstalled with your OS, but if you can’t get it preinstalled, hire someone or a group, like Zysys, to install it for you for a small fee. Crapware is all of the programs that come installed with your OS that are put on by the manufacturer. This includes screensavers that you have on your computer that you didn’t install. I have seen trial games, trial screensavers, and other trial software on brand new desktops. Those icons usually link to crapware. To see if your current computer has crapware on it, go to http://www.pcpitstop.com/neptune.asp and it will scan your computer for a variety of different problems. You need to be registered for PCPitstop and using IE. Overdrive will give you built in tips for optimizing your computer (including what software on your computer is crapware). If you want to find out what crapware the computer you want has on it, search the web for your answer or email us and we will be more than happy to help you. If the computer has less than two ports, either get a USB hub or forget the computer (the familiar is probably the better option). The amount of USB ports you have is very important because it WILL drive you mad having to take one thing out to plug something else in. On my IBM, I had an external mouse and keyboard plugged in, but I had to unplug the keyboard to sync my iPod. VERY ANNOYING. Try to get a computer with at least 2 USB ports or get an external USB hub. I recommend getting a computer with a DVD writer installed. If you have a CD RW/ DVD R drive like I do in my IBM, you can only create CDs and play DVDs. If you want to create a DVD and you don’t have an internal DVD Writer, you have to buy an external DVD Writer. If the computer you want doesn’t have a DVD writing drive (DVD RW), you could buy one and replace the drive you already have, but that will cost you as well. Alright, we have now gone over the things you should look for in a new laptop. I hope this helps and below is a summary of things you should look for. Zach Bornheimer is a musician and professional geek from South Florida currently attending the University of South Florida and is pursuing a degree in Music with a concentration in Jazz Composition. Find out more: http://zachbornheimer.com.